Trivandrum, 3 August, 2012: Thousands of residents lined up to protest against the move to bring in machinery to setup a leachate plant in the garbage treatment plant at Vilappilsala today. The City corporation after a court directive, decided to restart the operations of the plant by bringing in new machinery. This was done today morning with the help of extensive police force. 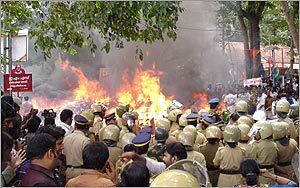 However the authorities had to surrender before the protestors which included women and children who set up fires and threw burning debris on the road leading to Vilappilsala. Police tried water cannon to disperse the crowd and arrested many of the protestors. Tension has been temporarily relieved after the Police authorities decided to withdraw the vehicles from entering into the plant.